It was hot and humid this weekend in St. Paul, Game Fair was over, and one of my dogs is off at training camp so I needed a boost to my grouse hunting morale. Fortunately I had just got my DVDs "Grouse, Guns, and Dogs" delivered. 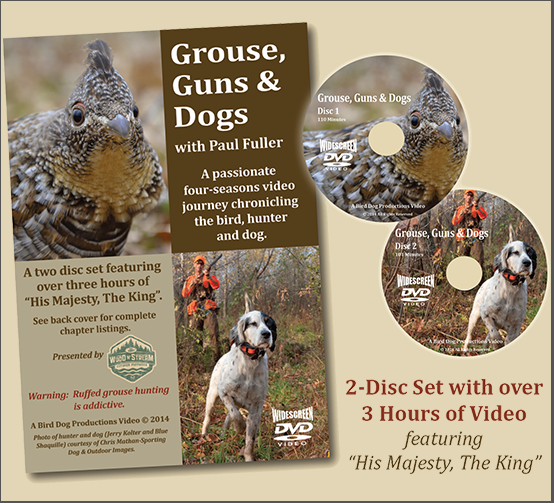 It is a 2 DVD set narrated by Paul Fuller of the Bird Dogs Afield TV show with over 3 hours of grouse hunting information and videos. Each DVD is broken down to a number of chapters covering a wide range of grouse hunting topics. My two favorite were both on Disk 2. Grouse Dog Field Trials and Grouse Hunting Over Pointing Dogs. The chapter on trialing has videos of actual trials and interviews with some of the participants. The chapter on hunting had a number of different hunts and showed grouse hunting in varying conditions. If you need a little something to jump start your grouse season or something to tide you over during the off season I think you will find this DVD set enjoyable.